For all the clamour, excitement, frustration and disappointment of Leeds United in the transfer window, there’s something soothing about an academy lad coming good. And once in a generation the stars collide to bring a host of talents through at once, setting the pubs alive with rumours of which starlet does what. That was certainly the case in the mid-2000s, with the likes of James Milner, Aaron Lennon, Scott Carson and Danny Rose giving the Elland Road faithful reasons to be optimistic. Many of those stars were instantly sold off, of course, as directors desperately tried to stablise the club’s finances. Not Morley lad Jonny Howson, who after a number of influential seasons in the heart of midfield became the club’s permanent captain seven years ago this week. A dynamic midfielder with an eye for a pass, Howson arrived in the first team fresh-faced and fearless, making his debut in a League Cup game against Barnet in September 2006. It proved to be a seminal evening for the club, Kevin Blackwell’s last as manager. Howson, held back a touch under Blackwell’s stewardship, began to flourish under new manager Dennis Wise, winning the man-of-the-match award on his league debut and never looking back. Like so many local charges before him, Howson made a connection with the fans early on. A Leeds loyalist himself, he soon found himself playing under his boyhood hero Gary McAllister, who quickly set about placing a greater emphasis on younger players. Howson was one of the main beneficiaries of that policy, featuring in no fewer than 40 League One matches in the 2008/09 season. Together with Fabian Delph he formed an energetic and exciting midfield and whilst compared with Delph he lacked consistency, his was a name soon followed by a host of Premier League scouting teams. Having earlier in the season become the club’s youngest captain since Billy Bremner in a baptism of fire at Millwall, Howson came alive in the play-offs, producing a match-winning performance in the semi-final comeback against Carlisle to score two goals including a last-minute winner. His wholehearted style of play lent itself to leadership, and much to the delight of United supporters he was named as Richard Naylor’s vice-captain in the run-in to the 2009/10 season at the age of just 21. This, of course, was a whirlwind season that saw the Whites promoted from League One as runners-up. Flashes of Howson brilliance were littered across the season, none more so than his goal in the final game of the season, a 2-1 home win over Bristol Rovers, which sealed the club’s return to the second tier. 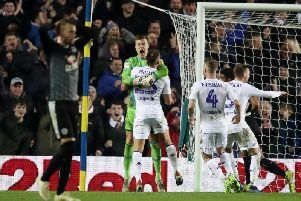 Whilst his raw energy and boyish exuberence never left his game in a Leeds shirt, Championship football seemed to bring the best out of him. Placed further forward, Howson began to control games, was more consistent, and added goals with marauding runs from midfield, his ‘perfect’ hat-trick away at Scunthorpe in October 2010 was a joy to behold. Named the club’s Young Player of the Year for 2010/11, he was the obvious choice to replace the outgoing Naylor as club captain. It was the perfect fit that lasted only one-and-a-half seasons as Howson left for top tier Norwich in January 2012. After 176 league appearances for the Canaries, Howson was widely linked with a return to Elland Road this time last year before Middlesbrough swooped in a reported fee of around £6m. The fans’ campaign to bring him home continues.